Since yesterday, Square Enix has been teasing a new game via a three-day alternate reality game that was due to end tomorrow. But their surprise has been ruined. 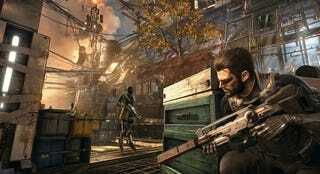 Today, an early leak from the Russian website Kanobu.RU (as found by NeoGAF) has revealed that the big tease is for Deus Ex: Mankind Divided, a sequel to 2011’s Human Revolution. Mankind Divided is for PS4, Xbox One, and PC, according to the leak. No word on a release date yet. We’ll likely hear more about the game as soon as Square makes it official. You can reach the author of this post at jason@kotaku.com or on Twitter at @jasonschreier.